Sydney and Melbourne are arguably the most popular destinations in Australia for international visitors, but did you know that Western Australia is the biggest state? It accounts for approximately a third of Australia’s land mass but receives a fraction of the number of international visitors that Sydney and Melbourne receive every year. According to Tourism Research Australia, Sydney and Melbourne received a combined 6.9 million international visitors in the year ending September 2018. The entire state of Western Australia welcomed about 955,000 – how disproportionate is that?! The Margaret River region is one of the most popular destinations in Western Australia and is world-renowned for its outstanding wineries, but is also famous for its stunning beaches, natural wonders and unique landmarks. The best time to visit is during the Australian summer months (December through February), but the shoulder season is fantastic too. The winter months are extremely cold so if you’re looking to hit the beaches then avoid visiting from June to August. 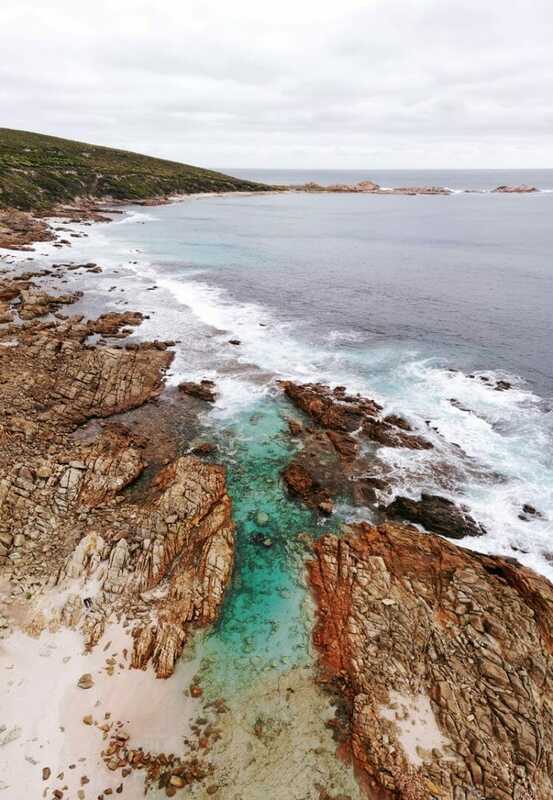 If you want to explore an underrated part of the world, add the Margaret River region to your bucket list now. 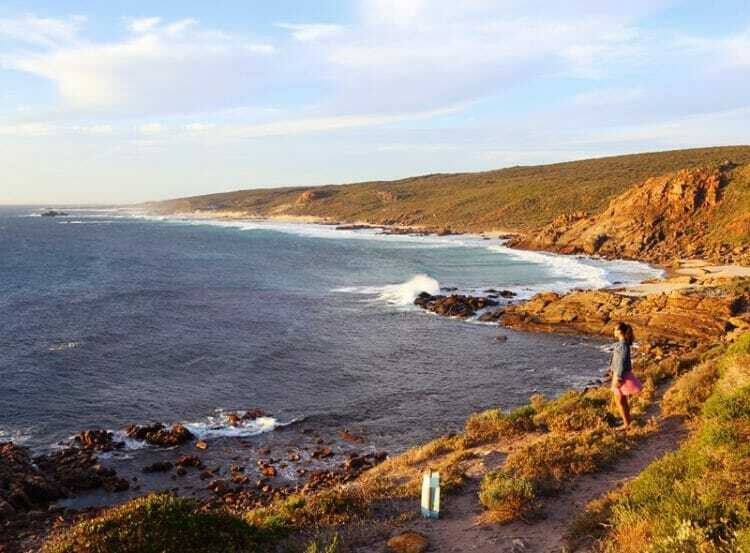 Read on for what to do in Margaret River, how to get there and where to stay. 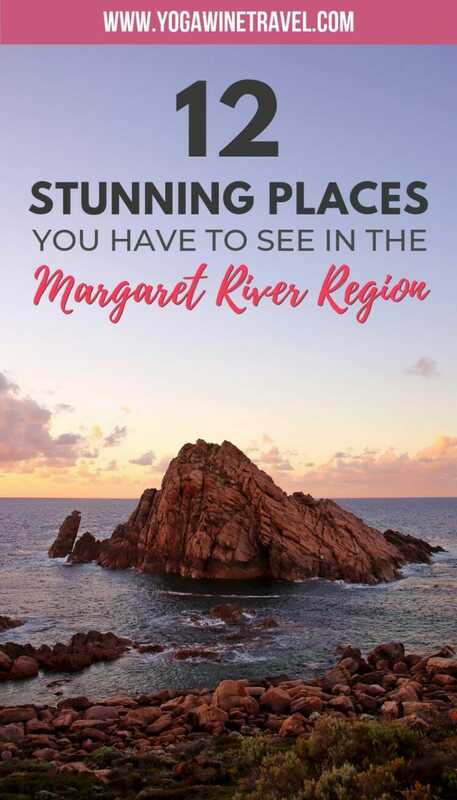 There are so many reasons why you need to visit the Margaret River region, beyond the fact that it offers incredible views and landscapes. 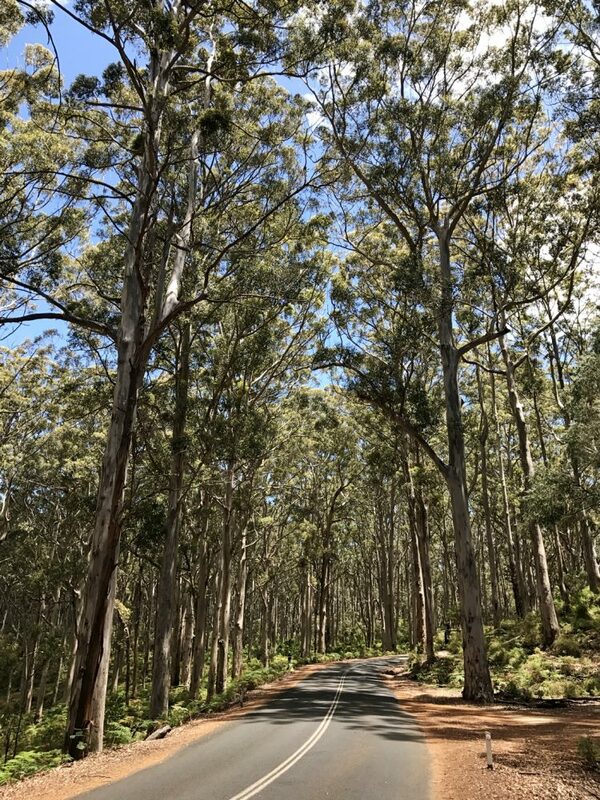 Click here to read 10 reasons why the Margaret River region should be on your list of places to visit! 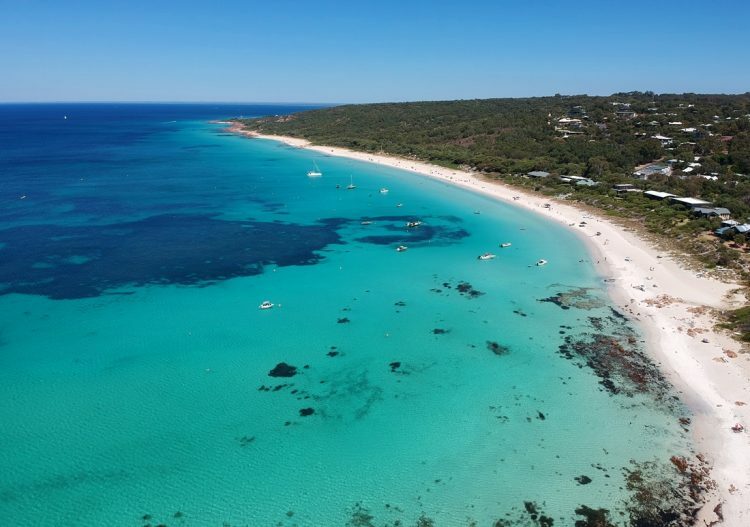 Getting from Perth to Margaret River is relatively easy if you rent a car – the Margaret Region is located 3 hours away from Perth. The entire region starts from Busselton and Dunsborough in the north down to Augusta in the south. From Perth your best option is to rent a car (we have used Keddy by Europcar, Budget and Thrifty in the past) to make the drive down south – remember, you drive on the left in Australia! Alternatively, there are a limited number of buses that you can take via South West Coast Lines, and I’ve also heard good things about this shared airport shuttle service between Perth Airport and the Margaret River region, though it appears to only operate Monday to Friday, and not on the weekends. Once you are in the area, public transport is pretty much non-existent and private tours and drivers are pricey, so the best way to get around is to self-drive. Parking is plentiful and Google Maps is very accurate – just stick to the speed limits and be alert when driving (especially at night) as kangaroos are known to jump into the middle of the street out of nowhere. Kangaroo collisions are no joke. If you don’t want to self-drive from Perth to Margaret River, get in touch with DBM Drivers, a locally owned wine tour and airport transfer business. Their rates are extremely reasonable compared to other companies, and were very reliable when we used them for a one-way airport transfer. Full day tours are $350-400 for up to 7 people, and one-way airport transfers are $400 for up to 7 people. Rates accurate as of December 2017. Looking for another great day trip destination from Perth? 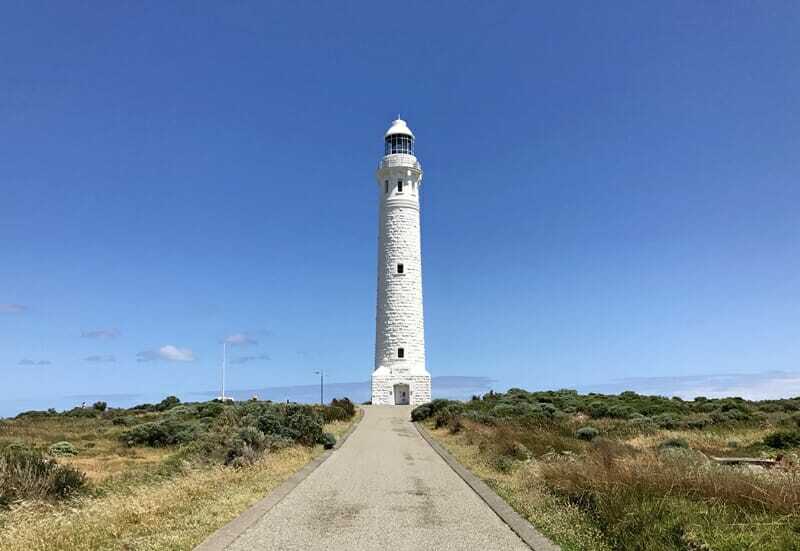 Check out my guide to Rottnest Island! Accommodation prices tend to be higher in this area, with nightly rates reaching as much as AUD$3-500 during the peak season. To get bang for your buck, make sure you stay in a convenient and picturesque town so that you can explore more of the beaches and coast. 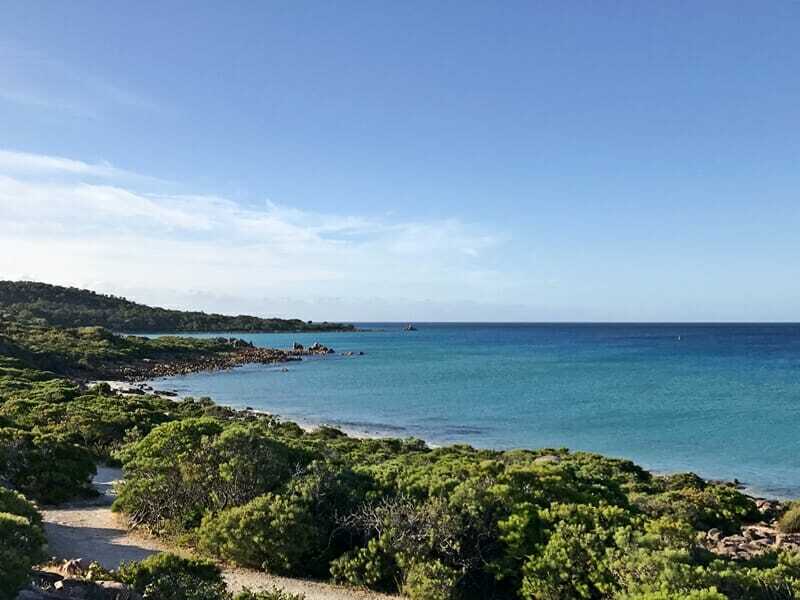 I would recommend staying in Dunsborough, Margaret River, Gracetown, Yallingup, Eagle Bay or Bunker Bay. Click here to find accommodation in the Margaret River region! Wondering what to do in Margaret River? 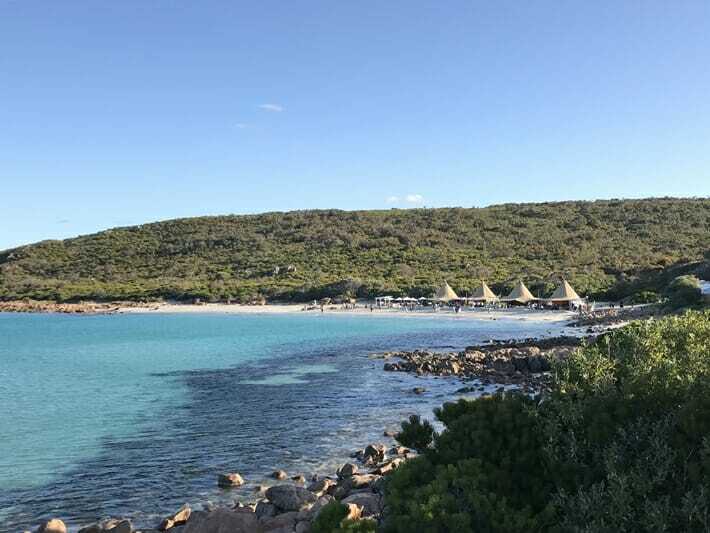 Read on for some of the best places to visit and things to do in this stunning region of Western Australia. To give you a sense of scale, see if you can find me in the photo on the right! 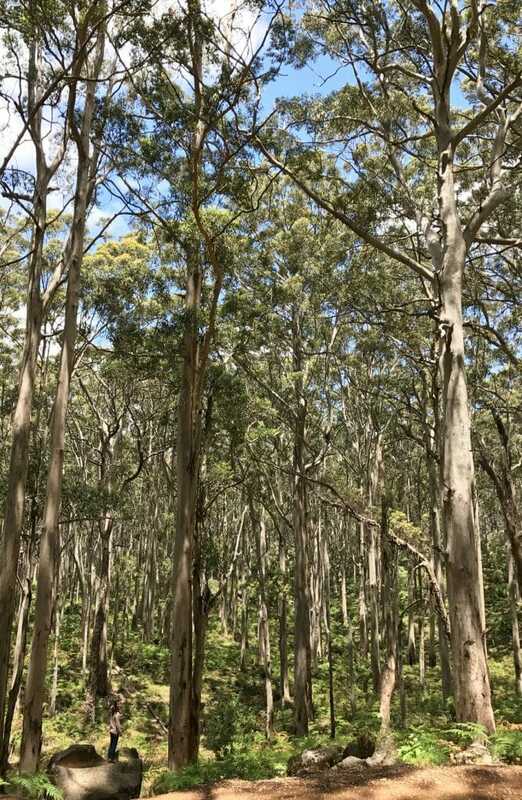 Boranup Karri Forest lies between Caves Road and the coast and is filled with pale-barked karri trees. Karri trees are one of the tallest species of tree in the world and can reach nearly 90 meters in height. There is no entry fee and there are small parking areas to the side, so make sure you drive through this amazing woodland during your trip. Cape Leeuwin Lighthouse is located in the south of the Margaret River region, where the Indian and Southern Oceans meet. One of the best things to do in this region is to go on a lighthouse tour, just look at this view! Lighthouse tours (AUD$20 at time of publishing) take place every half hour and is jam-packed with fascinating facts about the history of the lighthouse – the build, the keepers, the multiple shipwrecks prior to building the lighthouse and how operations are maintained (it’s a working lighthouse). 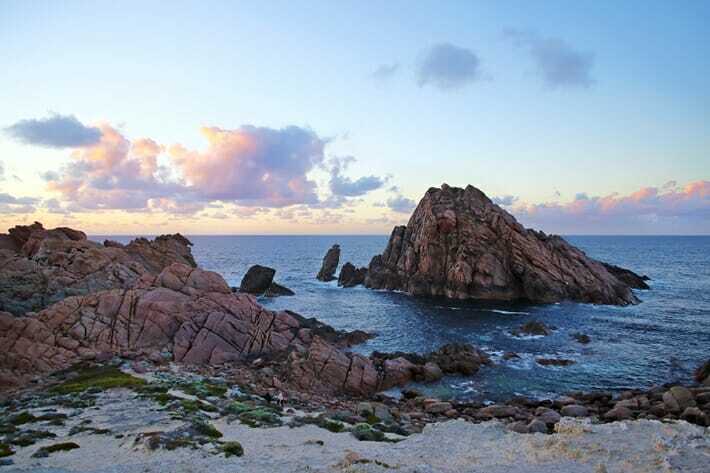 Aptly named for its conical shape, Sugarloaf Rock is located off the coastline and a popular sunset spot. 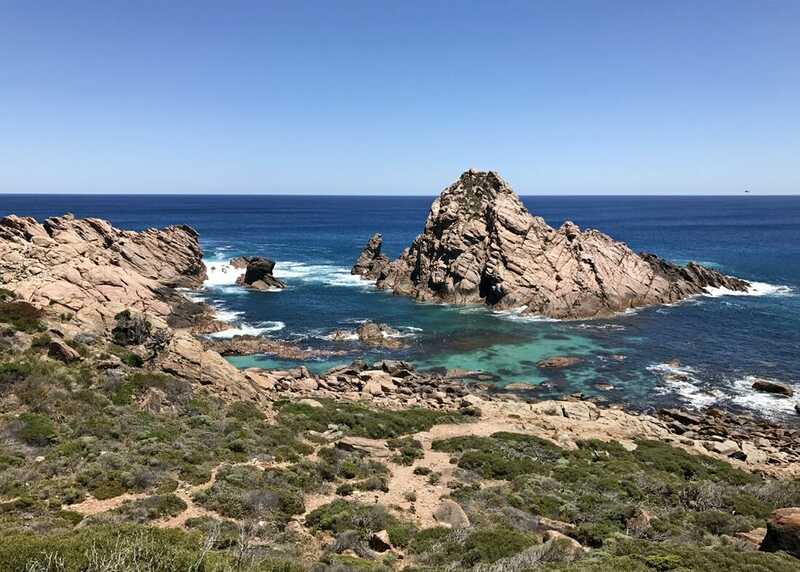 I don’t usually go out of my way to see a rock, but this one is pretty darn special and is one of the most famous Margaret River attractions. It’s spectacular both during the day, and during sunset – bring a blanket if you’re headed here to watch the sunset as it can get extremely windy and cold, even in the summer months. Did you know that the Margaret River region is famous for its delicious wine? Click here for unmissable vineyards & wineries to visit in the Margaret River region! 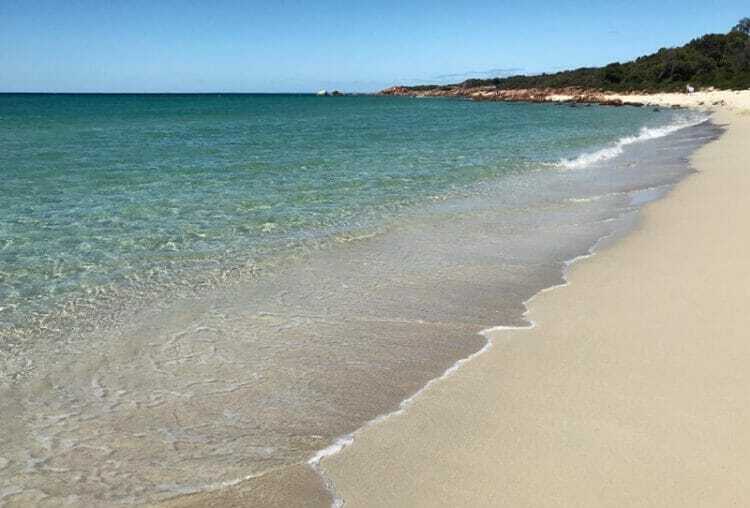 Meelup Beach is one of the most popular beaches in this region and it’s not hard to see why – it offers fine white sand, crystal clear water and is protected from wind and waves – what’s not to love? If you are traveling with children, this is the perfect beach to take them to. 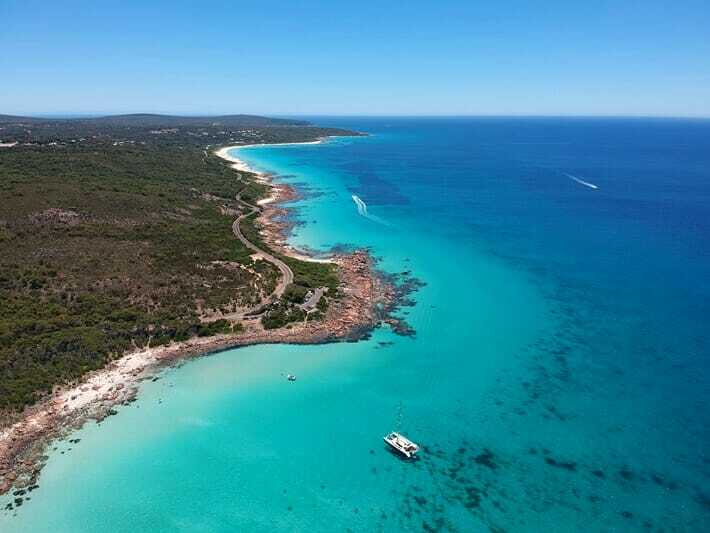 Located nearby Meelup Beach, Point Piquet is another beautiful bay with perfectly turquoise-coloured water. 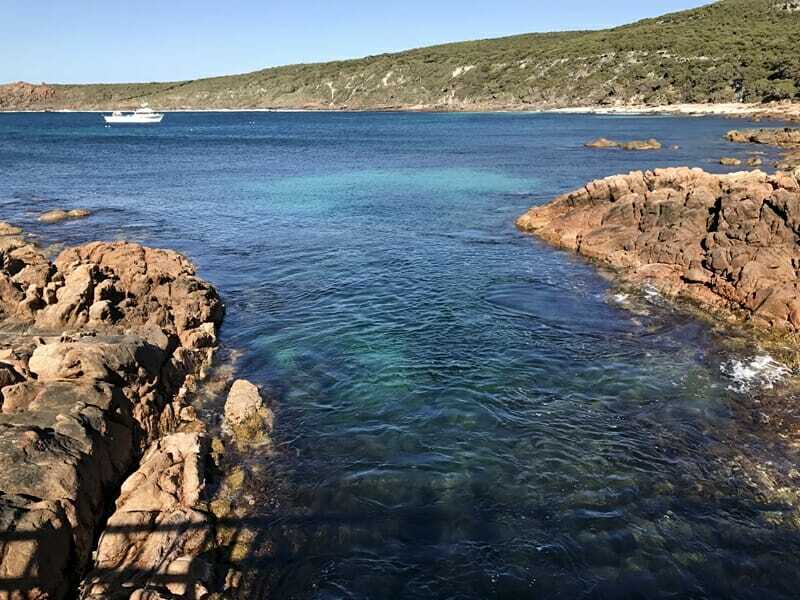 This is a great swimming spot to check out and doesn’t tend to get as busy as Meelup Beach if you want the bay to yourself. The water is crystal clear, and offers a nice sandbank for beginner to intermediate surfers when the winter swell hits. Click here for a selection of accommodation options in the Margaret River region! Tip: need some flexibility? Double check the cancellation policy – most places offer free cancellation! Bunker Bay is a great place to grab brunch followed by a dip in the ocean. The long stretch of beach is a great place to soak up the sunshine and is considered one of the top beaches in the region. Bunker Bay Cafe serves up delicious coffee and lunch – the perfect lazy afternoon spot! 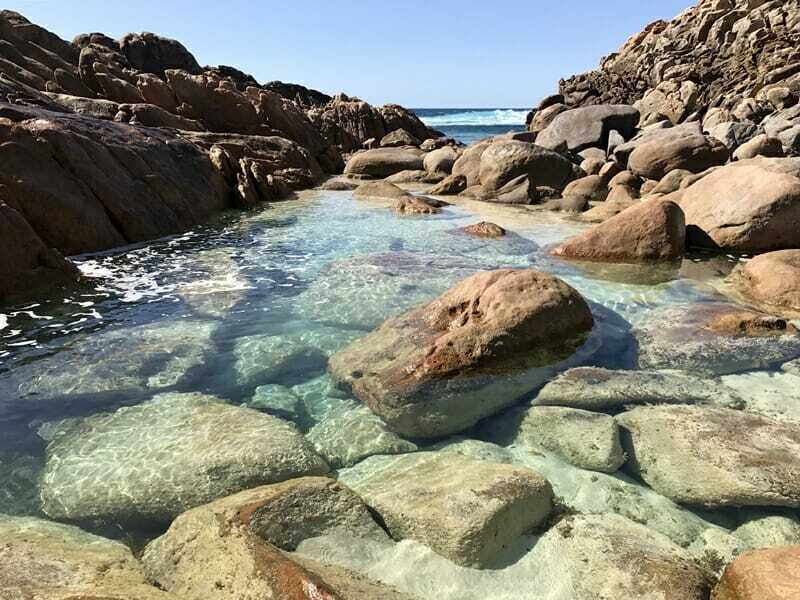 This natural rockpool is located in Yallingup and is a hidden gem in the region. Bring your swimsuit (and sunscreen – the sun is brutal in Australia) and drive here for a fun afternoon. It can be easily accessed by car – take the trail on the left hand side of the parking lot and make your way down towards the coast. Turn right when you reach the fork and you’ll find yourself at the rockpool. You’ll have to climb down so wear appropriate footwear. 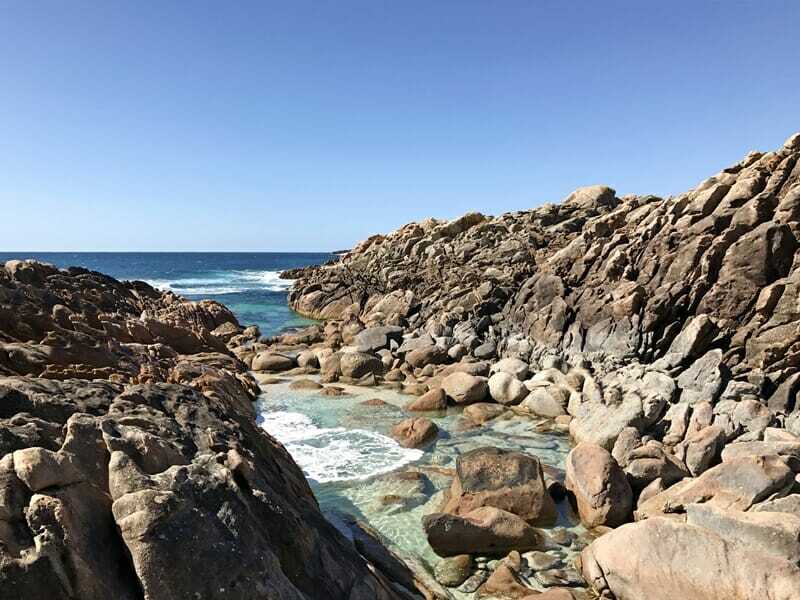 Canal Rocks is natural geographical feature along the coast of the Margaret River region. A natural channel was formed after centuries of erosion from the ocean’s waves and can be explored on foot through wooden pathways. 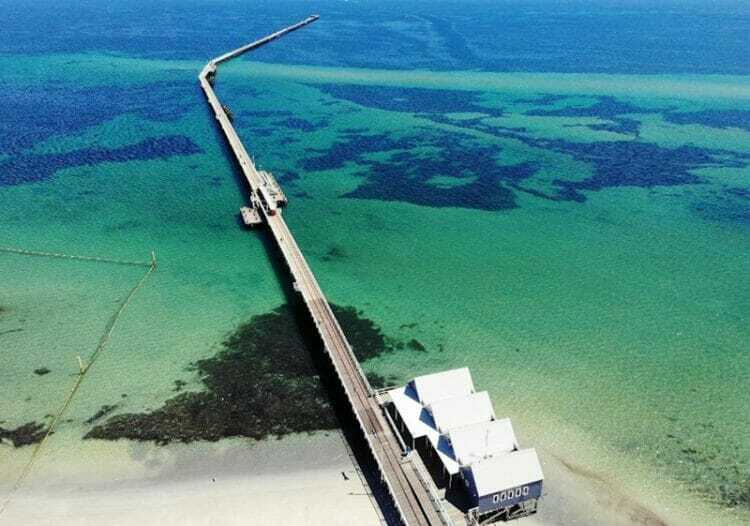 You may be thinking to yourself, “Why is a jetty on this list?” The reason is because it is the longest wooden jetty in the southern hemisphere, spanning more than 2 kilometers in length! Walking the entire length will take you approximately 25 minutes. 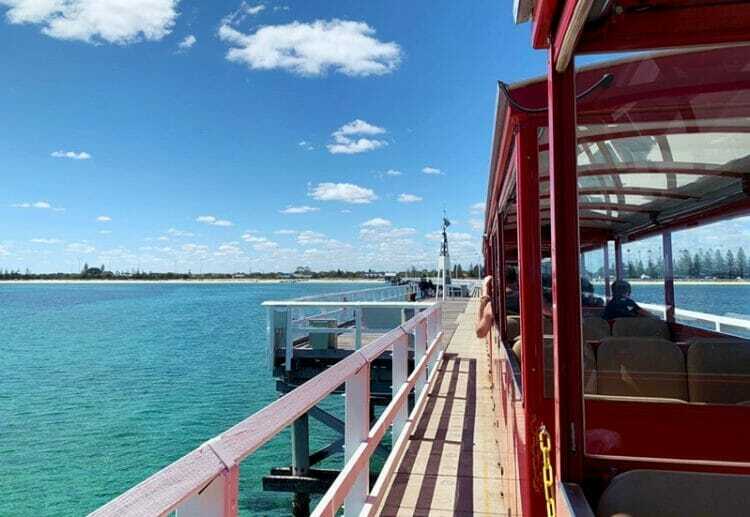 There is also a small “train” that takes you up and down the stretch of the jetty as well as an underwater observatory where you can check out the marine life. 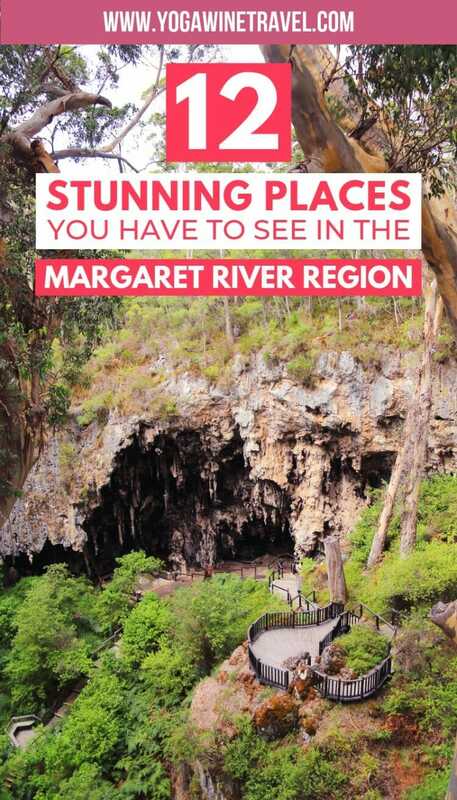 It’s one of the more popular Margaret River attractions to check out if you’re traveling with young children. Hamelin Bay is home to a few unique residents – a fever of sting rays that often swim right up to the shoreline. They’re often found at the boat ramp on the beach where they are fed scraps by the fishermen. 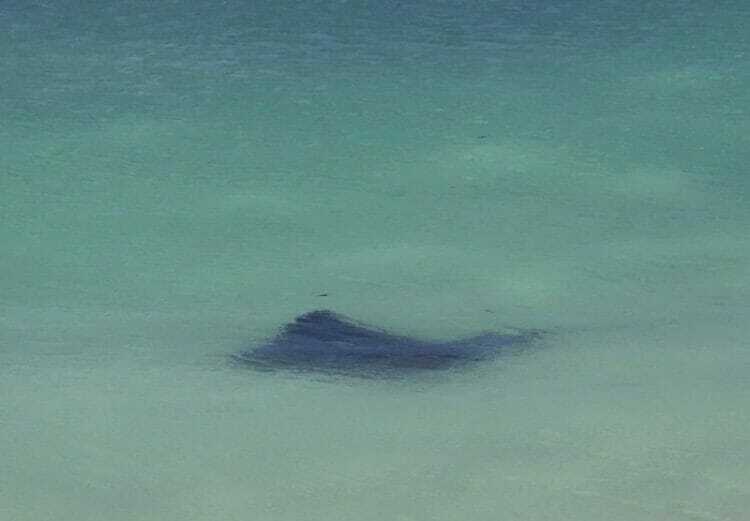 If you’re looking to see the sting rays in Hamelin Bay, choose a sunny day with little to no swell so that the water visibility is higher. 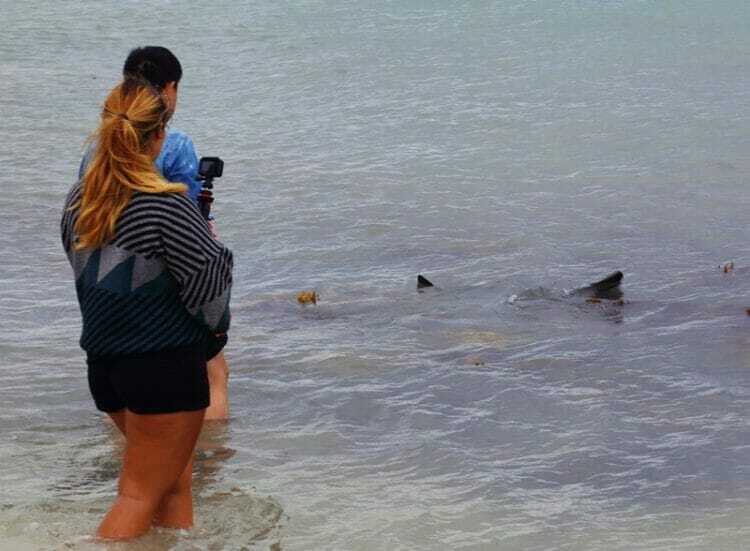 It’s also important to be respectful as the sting ray are wild – avoid harassing them or trying to touch them too much. The region is also home to more than 100 natural caves, some as deep as a 12-storey building! 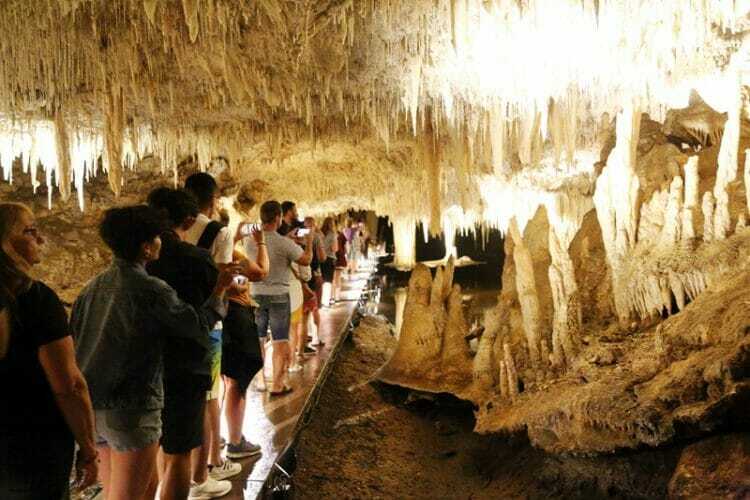 There are 4 show caves in the Margaret River region that are currently open to the public, and you can join semi-guided tours to explore deep underground. 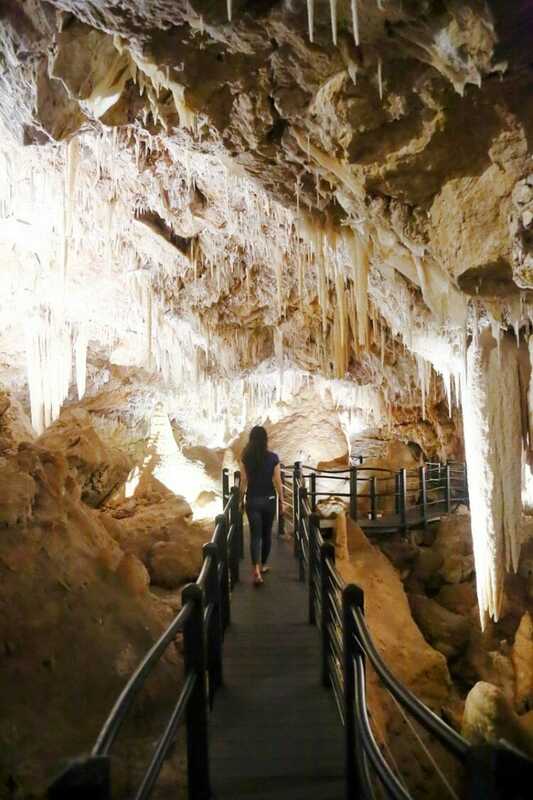 The Lake Cave near Boranup Forest is spectacular and is suitable for most visitors (children under 4 visit for free) but you’ll need to walk approximately 300 steps down and back up. The stalactites, stalagmites and straws in the cave are incredible and there is also a rare suspended table formation – the only of its kind in the world. You might also want to check out Ngilgi Cave – the region’s first-ever tourist attraction which visitors were once lowered into via rope. Today, there is a set of stairs and pathways leading visitors through the expansive underground cave – it is a LOT bigger than you might imagine and there are some tight spots to navigate through. Don’t let the small entryway fool you! Tickets cost $22.5 per person for adults, but you can also purchase multi-cave passes at a small discount. In addition to Lake Cave or Ngilgi Cave, your options include Jewel Cave or Mammoth Cave. 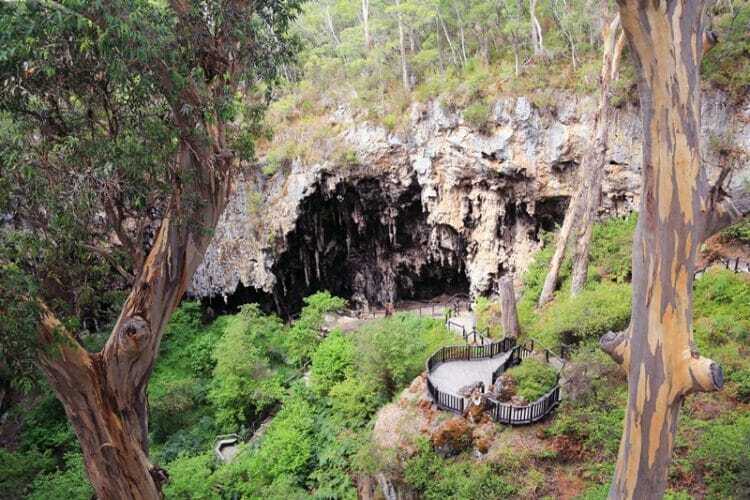 Editor’s note: Many thanks to the Margaret River Busselton Tourism Association for hosting our cave visits. 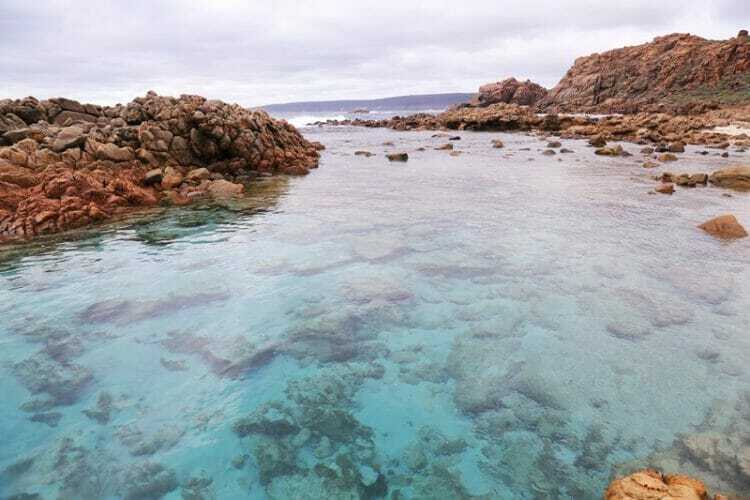 The Aquarium, like the natural spa at Injidup, is a natural rock pool that is largely protected from waves and swell. The crystal-clear water is almost a turquoise colour and makes for a perfect swimming spot on a hot day. You’ll have to walk on an unpaved trail for about 15 minutes to get to this secret spot. 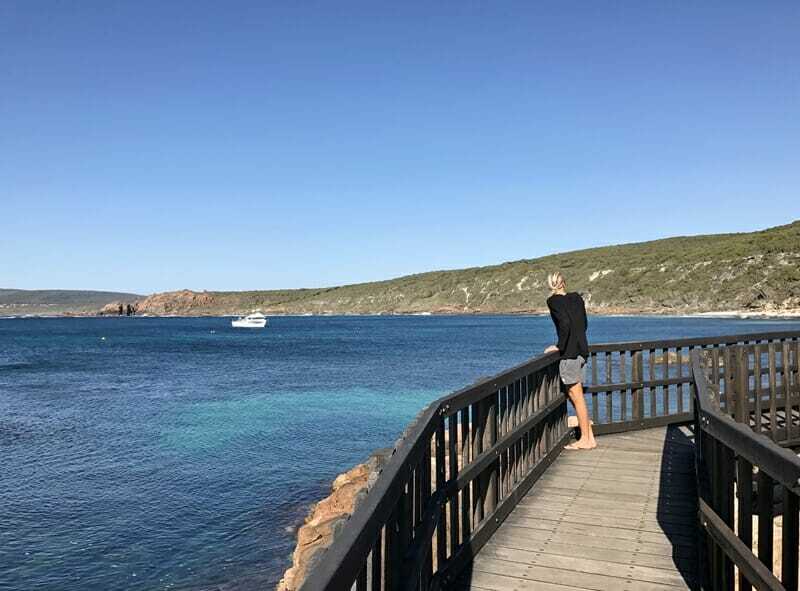 The Margaret River region also has one of the longest whale watching seasons in the world: the season runs during the 2nd half of the year and whales are often spotted during their migration. More details here. If you love wine, then you’re in luck. The Margaret River wine region is home to approximately 120 wineries and vineyards and you can visit these institutions for lunch and wine tasting. Finding it hard to choose which ones to visit? 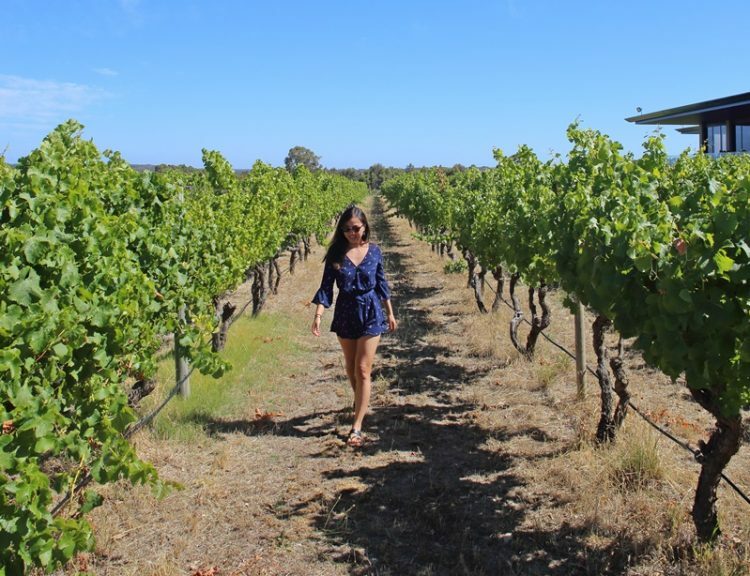 Click here for my article on the top Margaret River region wineries and vineyards not to miss! The Margaret River region is also one of the best places to get your surf on, especially for more experienced surfers. Click here for more information on different breaks in the area. Looking for more travel tips and recommendations for Australia? Head on over here! 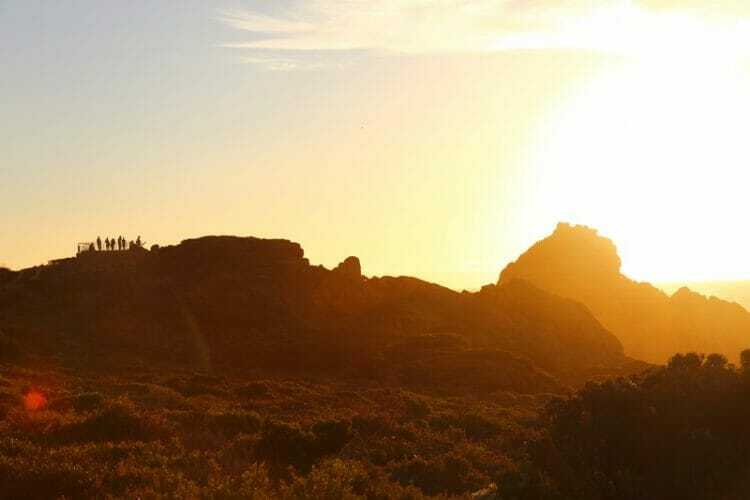 Have you ever been to the Margaret River region? Tell me all about your favourite spots in the comments section below! This article contains affiliate links. If you choose to book using these links, I will earn a small commission at no extra cost to you. Thank you for supporting my website by using these links, I only recommend products or services that I have personally had positive experiences with. Yeah for me as a European all I can hear is visit Sydney And Melbourne. I just think west part of Australia need more advertising as it looks beautiful! I am dreaming to go to Australia one day and do a road trip around the continent ! ( or at least half of it 😉 ) I feel like no matter where you gonna drive you will see stunning views! Your photos are lovely thank you for sharing ! Australia is such a big and beautiful country, I think it would take years to explore it properly from head to toe! Thank you for taking the time to read this, Casey! My bf is a photographer and we travel around the world to take stunning photos and post it on our website. This is definitely a place to visit and hopefully we’ll be able to fill our website with amazing photos as yours. I hope you get to snap some pictures of this region soon! Wow, I must admit I have never heard much about the Margaret River. Love all the places you have suggested in the post, especially the lighthouse. 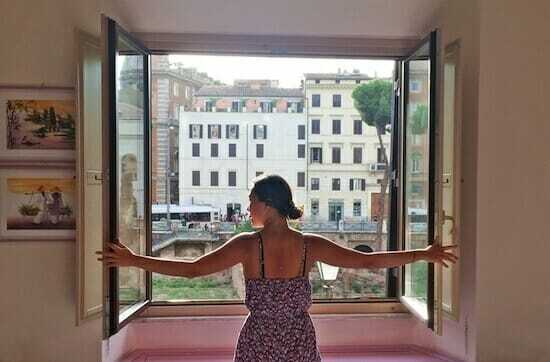 The view is just out of the world! The view from the top is seriously spectacular! I am an European and it has always been my dream to visit Australia, but somehow it is never on my list, maybe because it is so far. But after seeing this stunning photos I might do something about it. I hope you get to visit, Elena. If you’re making the long trip over you should spend a few weeks exploring the country! I would definitely like to visit Margaret River Region after reading your post. I did not know about this because it is not that popular which I like. You have featured a lot of beautiful places to visit. The water is so clear and clean. Also, I would like to see the whales there. I’m hoping to go whale spotting when I’m there at the end of the year – I hear it’s an amazing experience! Wow, visually stunning is right! I would love to see the Boranup Karri Forest, and the Injidup Natural spa. Though, I wouldn’t complain about visiting any of the locations. Truly gorgeous! Those trees are so incredibly tall, you have to see it to believe it! Hope you make it to Australia soon, Ricarda! It’s a massive country with tons to offer. Great post! I like it when people focus on places less travelled. It looks beautiful here! It’s a shame I dont like wine! But I love beaches and being by the coast so that’ll do for me 🙂 I’m yet to visit Australia but it is likely to be a big trip in about 2019 so I have pinned this for future reference. Thanks! I can’t wait to read all about your trip in 2019! Wow! For some reason this isn’t the Australia I’d always imagined! This area was completely unknown to me and yet I see it offers so much! 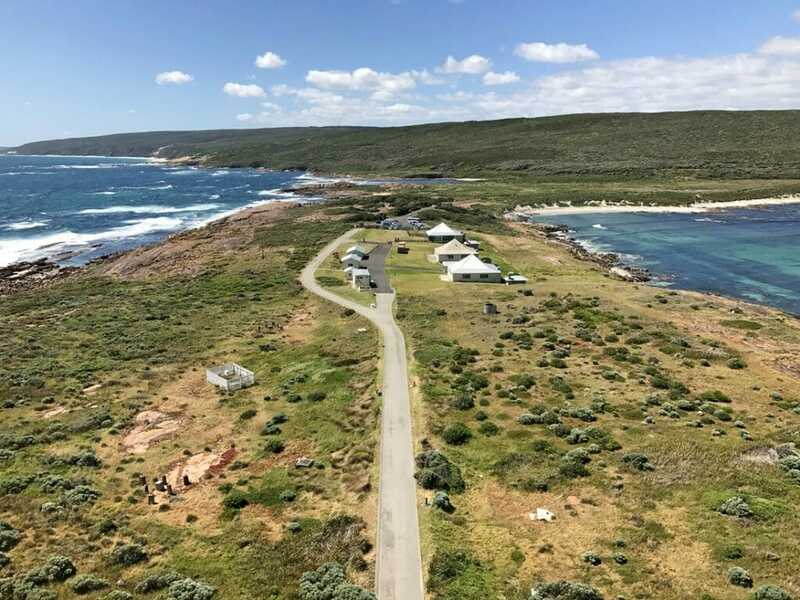 We’d definitely love to explore the Boranup Karri Forest and the Cape Leeuwin lighthouse! It’s a humongous country, Dany! 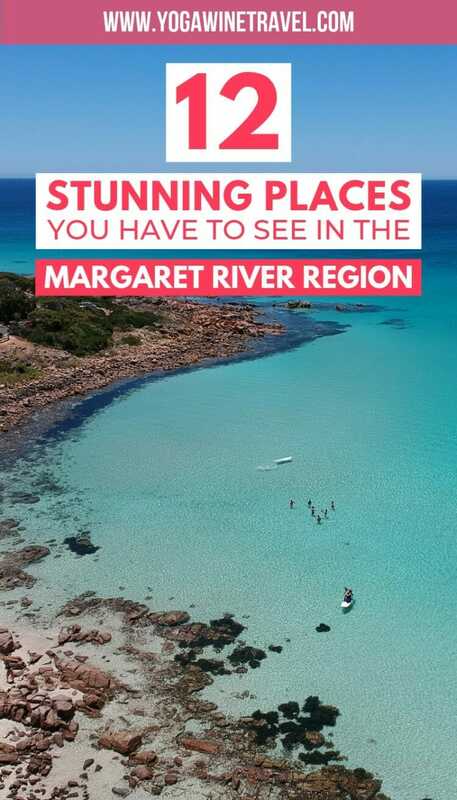 The Margaret River region is just a small part of Western Australia – there’s even MORE to see and do! I’ve heard of the Margaret region for wine but it looks like there’s some great things to do. My husband is Australian so will add this to the list for a visit! Where is your husband from? This region has plenty to offer, I hope you make it out there soon! Exploring Australia is a dream! I’m really waiting until my son grows up a bit, so he can walk and run around instead of me carrying him around, and then we go on all those amazing hikes there! He’ll love it! Make sure you visit Rottnest Island to see all the adorable quokkas as well! This region is just breathtaking, I hope you make it out there soon! I only scratched the surface of what WA has to offer, but I’ll be back to sample more vino! OMG!! I was in Perth a few months ago and I loved it, but all my friends kept telling me I should check out Margaret River because of how much you could do , and so I swore that I would go back. This post made me want to go back even sooner!!! AMAZING. I am definitely going to keep reading your posts about this area. Thanks so much for sharing!! My trip will be totally centered around these things! I’m so glad this inspired you to go back, Justyn! What a beautiful area. I’ve never been to Australia but I do have two nieces in Melbourne. I have to say I would love to visit. Beautiful pictures too. I hope you visit soon! Melbourne is on the east coast and this is on the west, you’ll have to try to visit both sides of the country! Wow, this region looks so beautiful! I love your photos of the forests, beaches, and lighthouse. I have wanted to travel to Australia for a long time, and every post I read about it makes me realize I will need a few months at least to see everything! I will definitely remember to check this region out when I hopefully visit someday. I can’t even imagine how long it would take to properly explore everything that Australia has to offer: it’s massive! I feel like Australia really embraces the outdoor-beach living. Who wouldn’t though? The water is so pristine! I’d love to spend some time here! It’s definitely an integral part of the culture! Beautiful place indeed! The rock formations are really stunning; we get a great love for rock formations considering that we are rock climbers. Those beaches too are really nice places to visit with no or few people around. There are lots of great national parks you can visit if you are avid rock climbers! 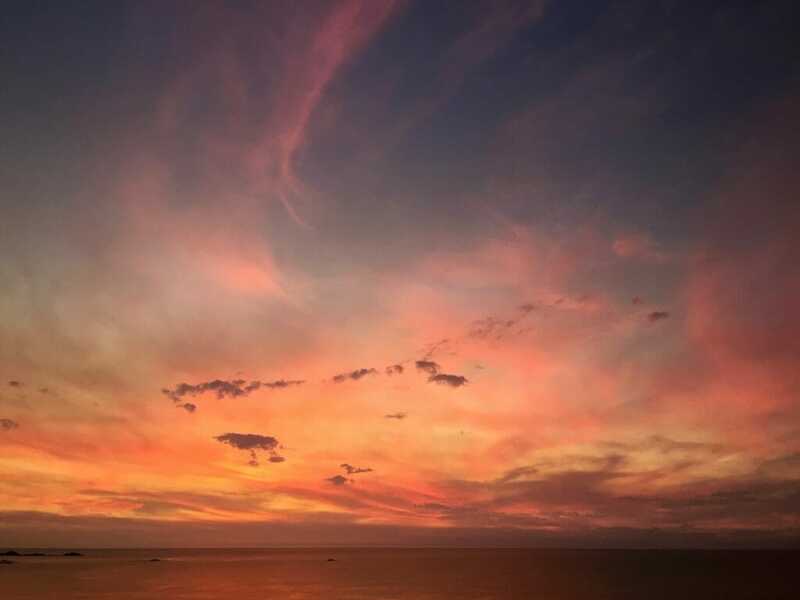 Melbourne is the city I want to visit in Australia but after reading about the Margaret River Region I’ll add this to my itinerary as well and even up those visitor numbers! 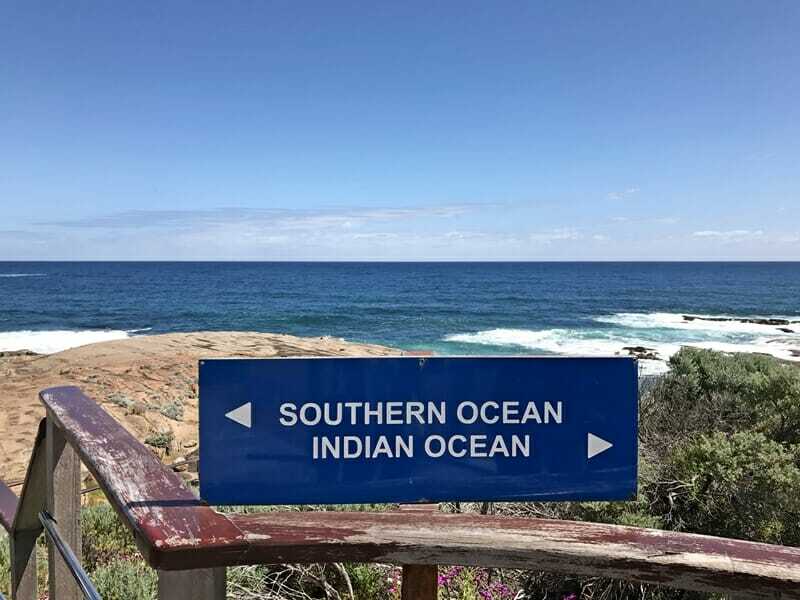 I would have to visit Cape Leeuwin Lighthouse and see where the Southern and Indian oceans meet. This area is definitely underrated! 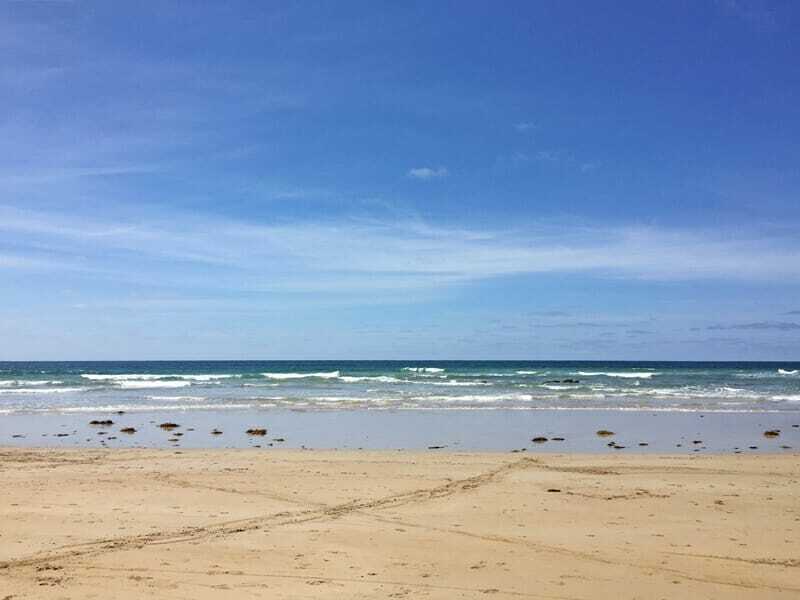 Melbourne’s fantastic as well though – make sure you head out to the Great Ocean Road! I’m moving to Australia soon so I’m constantly looking for cool places to see! I am guilty of not even giving Western Australia a second thought, but you have changed my mind! Where are you moving to, Chiera? How exciting! The thing about living in Western Australia is that it can be expensive because of the mining boom! So underrated and incredible. Thanks for taking the time to read this!